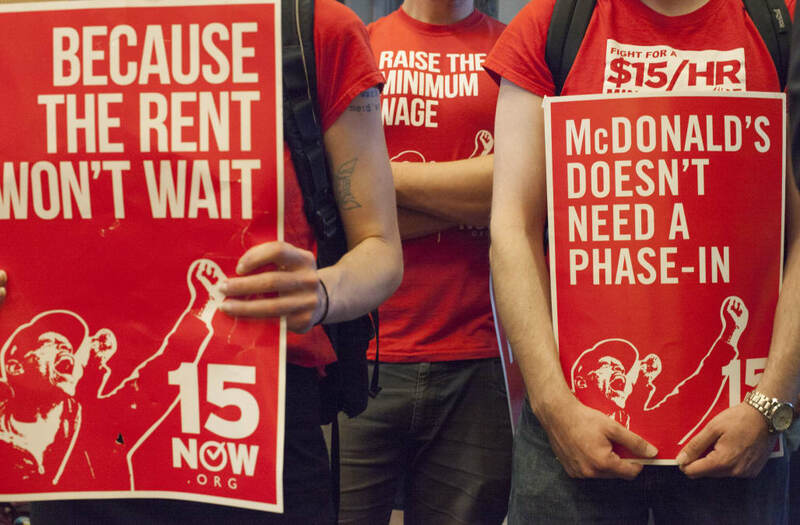 Not all is rosy in Seattle as the city gradually pushes to raise the minimum wage to $15 per hour, according to a new study that suggests hiring and the number of hours worked among lower-wage employees took a hit last year as minimum pay rose. The National Bureau of Economic Research unveiled a working paper on Monday that found the number of hours worked in low-skill professions dropped more than 9 percent in Seattle during the first three quarters of last year, while low-wage jobs declined by 6.8 percent, or by more than 5,000 positions. That all coincides with Seattle raising its minimum wage to $13 per hour in 2016 amid the city's gradual push to boost floor-level pay to $15. The University of Washington researchers who authored the study pointed to this wage increase as the root cause of the hourly and employment declines. "There is widespread interest in understanding the effects of large minimum wage increases, particularly given efforts in the US to raise the federal minimum wage to $15 per hour and the adoption of high minimum wages in several states, cities and foreign countries in the past few years," the authors said in the report. "These results suggest a fundamental rethinking of the nature of low-wage work." Indeed, the study found that the net cons of the minimum wage uptick outweighed the pros by a measure of three-to-one and that low-wage workers lost an average of $125 per month as a result of the ordinance, which increased hourly wages by 3 percent while dragging on payroll totals and hours worked. Seattle became one of the first major cities to approve an eventual $15 minimum wage back in 2014. Little empirical evidence existed then about what exactly would happen to the local economy in a city with a minimum wage more than double the $7.25 per hour bottom mandated by the federal government. Research has been across the board, with conservatives and those on the right pointing to studies like this one suggesting higher minimum wages disincentivize employers in lower-paying industries to increase hours or payrolls to help cut down on costs. But progressives have often drawn on a hefty pool of research suggesting minimum wage hikes result in only moderate – or even immaterial – impacts on overall hours and employment. A University of California, Berkeley study published earlier this month, for example, found "no significant disemployment effect of minimum wages up to $13." The reports pull from two completely different collections of data, and both have a handful of shortcomings and limitations that suggest the findings may not be one-size-fits-all across the economy. With Seattle's tech-heavy economy, in particular, it's tough to say how consistent the Emerald City's pay raises would be applied across the rest of the U.S., especially considering Seattle sits in a state where the minimum wage – $11 per hour – is already significantly higher than what the federal government requires. "One cannot assume our specific findings generalize to minimum wage policies set by other localities or at the federal or state level," Monday's NBER report said. "The impacts of minimum wage policies established by other local governments likely depend on the industrial structure, characteristics of the local labor force, and other features of the local and regional economy." Both reports, however, found the restaurant industry, specifically, was relatively immune to employment declines at Seattle's $13 minimum wage, which provides a bit of goods news for restaurateurs in the Rainy City.